It’s Lunch Time – Do You Know What Your Child is Eating? This is the middle school menu at my daughter’s school. Let’s take a closer look and see how we can navigate the murky waters of school lunches and better choices. As you can see, the lunch folks have been kind enough to detail what makes a healthy lunch per the USDA guidelines. And just like any of us as adults would head to a restaurant, there are almost always healthier choices, relatively speaking. Kids generally have a few factors they are facing when headed to the lunch line: 1) they are hungry 2) they wonder what their peers are eating 3) they want to eat something that doesn’t turn them off and disgust them. When we are hungry, we aim for warm food, fat, and what smells good. I don’t know about you, but given the limited healthy options here, it could be a challenge to strategically maneuver through this menu unscathed. Obviously, the healthier choices are the salads (assuming dressing is on the side), turkey sandwich, bean burrito, the variety of fruit/vegetable offerings, and the 1% plain milk. 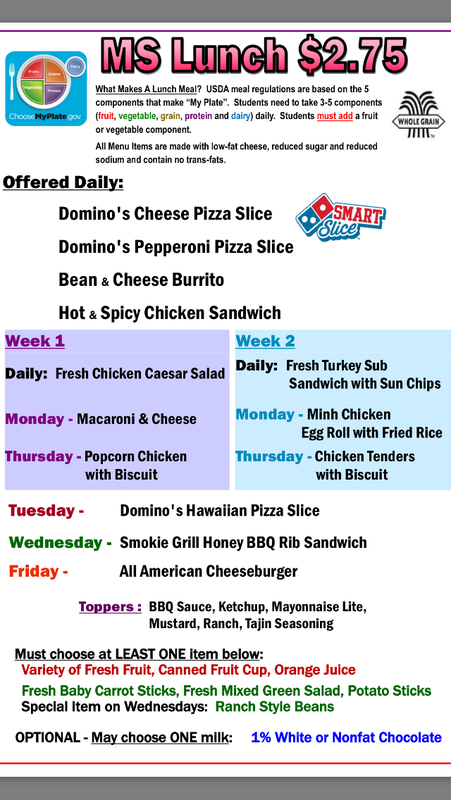 Then again, the portion sizes are quite controlled in the school lunch program, so if a child were to order the healthier option but find that it doesn’t taste good or satisfy, you can bet they won’t be eating it all anyways, and their chance of snacking on higher calorie foods later in the day are much higher. This is the perfect example of having to choose between the not great choices. Let’s face it, there are lots of processed foods here, so the best option (outside any specific dietary restrictions) is to choose the protein entree that most appeals, and then round out the meal with at least one full serving of fruit or vegetable and the plain milk. It’s a compromise, but it’s likely the most realistic compromise you could get a child to comfortably commit to choosing. I wouldn’t consider potato sticks as a real vegetable option, but the rest of them look acceptable. The harsh truth is that plate waste studies show that at least 50% of the food served for school lunches is tossed in the garbage, so while it’s nice to think that school lunches make up 1/3 of a child’s daily intake, it’s quite likely that number is off. The food eaten prior to and after attending school would be considered a more “influential” eating period due to the family influence and foods offered at home. Research shows that kids actually tend to gain weight over summer, and I think this has more to do with the lack of daily eating structure, the increased number of times food is being consumed over the day (the average American eats 9 times a day!! ), and the likelihood that there are more meals being eaten outside the home. As with most eating out, this poses a great learning opportunity to teach your child how to navigate through restaurant menus so that they are equipped with the right tools to take care of their bodies. Make sure you talk about it, and for those of you who provide your child with a very small lunch from home in hopes of helping them shed a few pounds, keep in mind that if they are hungry there is a high chance they are getting additional food from their friends, who might be either bringing food from home or might be ordering food off the school lunch menu. Talk to your children about the foods offered, and even if you pack their lunch, use the menu as a topic of discussion and ask them to look up ingredients, labels, and foods to bring about awareness and understanding. Despite what is offered at school, a restaurant, or at a friend’s house, ultimately the child must have the tools and critical thinking to make the best choices in the environment they are in, and that goes for adults, too! Kale is all the rage right now. There was a time when kale was used primarily as a plate garnish, and not necessarily meant to be eaten. And I can remember when quinoa was a complete foreigner in the food aisles. If you knew how to pronounce it in 1992, you were most certainly a die-hard hippie. It’s a tale of kale and quinoa…two food finds that only the granola factions were aware of, up until a few years ago. From The Cheesecake Factory to Whole Foods Market, kale and quinoa have now crossed over into mass market and might even be considered health food staples. But today I want to talk about chard. Chard is another green, leafy vegetable that seems to have faded into the background in more recent times, but tastes so much better than kale! 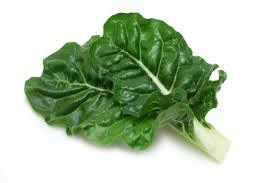 If you have been forcing yourself to eat kale out of peer pressure, give chard a try and don’t ever look back.